Los amables integrantes de Dreamgrave cumplieron su palabra y pudimos tener una interesante entrevista, en inglés, la cual colocaré tanto en el idioma original como su traducción abajo. ELOMC: Who is Dreamgrave and how come you have to get together? Dömötör: Well, it's a way too long story but I'll try to sum up for you. In the very beginning Dreamgrave was a gothic/doom metal band with some successful moments in Hungary but without a stable, reliable membership. As the founder member I've struggled with finding musically competent and creative members for almost four years. Although I ain't a bedroom musician I started to work on fundamentals of a concept called "Presentiment", did some hungarian poems and tons of shorter or longer compositions from black metal to post rock. Without a working lineup those songs remained only some Cubase project files for me. Then in September 2012 I met János Mayer who has not only shifted the songs towards a more progressive approach but became the turning point in the band's history. So basically the creative force behind the band became whole: my hard rock and gothic/progressive death metal world met János' modern progrock. 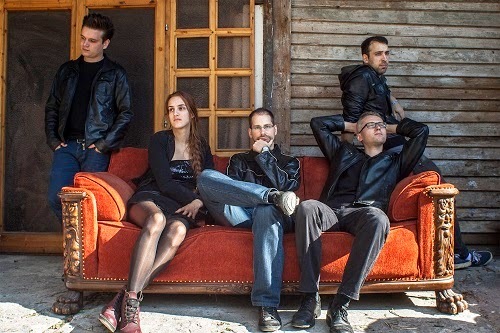 In September 2013 the band started recording the demos with the beautiful soprano of Mária Molnár. After a lot of hard work and with the help of Gergő Drahota (VolumeFeeder) and Jenő Godó the band finally went into the studio to record the "Presentiment" LP, a concept album consisting of eight progressive dark metal movements. ELOMC: Dreamgrave seems to show influences from many sounds and bands, but the fact is none is openly recognizable, how do you define yourself? Dömötör: It's great to hear that! One of our most definite goals was to display the utmost of our ideas, utilizing as much different influences and skillset of ours as we can, without pushing the songs towards an exact musical direction, but respecting what the conceptual charge of the songs and the album as a whole deserves. This was by far the hardest part. If you insist to get a strict definition: on "Presentiment" Dreamgrave plays post-gothic progressive dark metal. ELOMC: One of the things that amaze me the most with “Presentiment” – other than it is a great creative work - is that it is, in fact, your first full-length record, and a conceptual disc. Usually the bands do not start with a full exhibition of their skills, but instead show their growing in time. Are you aware that the public will expect something as powerful as this work in the future? How are you going to do that? Dömötör: We are quite sure that "Presentiment" is just the tip of the iceberg as we have tons of different ideas bubbling up every day. Presentiment isn't the full spectrum of what we have, or trying to be artistically. Constant exploration is a must for us. Now, just having the digital release ticked off, we virtually have to start over and procreate a new instance of a musical realm since we don't want to repeat ourselves by any means - actually this is our second most important goal with János. 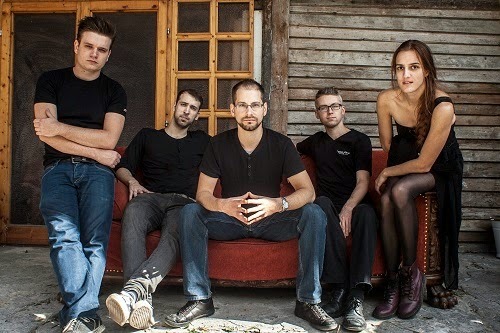 János: Yes, and we don't know what the public will expect since we're actually unknown for the progressive metal scene, yet! But what we know is, that we don't tolerate mediocre ideas, compromised instrumental or vocal tunes. We believe, musical diversity is the main ingredient for the complete and honest self-expression, and this is the most important trait where "Presentiment" shines. Feedbacks from the audience and reviews confirms this so far. ELOMC: Do you have plans to sign with a record company? Have you been contact by any? Dömötör: None of them contacted us so far. And we are also quite sceptical. Let's say it depends on the deal. :] The most burning objective for us now is to become known in the progressive metal scene and gig every country which can be taken into consideration. ELOMC: Does Dreamgrave have plans for playing live? Do you tour now? Will we see you in Latin America? ELOMC: How well has “Presentiment” been received by the public and press? Was it what you expected? Dömötör: Clearly positive. Not a single bad word came from that limited number of reviews we've received in the last few weeks! That's the hardest part: get featured in magazines when you are totally anonymous for the industry. Fortunately Angry Metal Guy (and you guys! ;]) featured us in your magazine which caused a sales boost, instantly made almost 20% of the recording and mastering fees covered. Hungarian press is out of the question with us, they simply ignore the band, but that's how it goes in Hungary: if you are not some sort of a stoner or indie band, you don't do a gig every weekend in the capital with celebrated bands or you just simply don't pal up with the right person you're out of context. ELOMC: Just for the sake of a ‘difficult question’ I will make a statement and would like to hear your reaction: It seems to me that Dreamgrave has great potential, you sound like you have real academic musical formation, and since you self-produced “Presentiment”, I’d say you are not the stereotypical musicians, hungry for success, but well mannered, probably upper middle class young persons, to whom this is just a hobby. Am I right? Dömötör: Partly. In fact this album means the world to us right know. It's far from being just a hobby: yes, we do this in our spare time, but strictly because of financial reasons. In the current stage it only takes the money. But we won't stop here. Only Mária has academic knowledge about music. János studied ten years to play the piano but only in an elementary form. Of course every one of us plays music since almost a decade, and comes from a musical background, but this only means basic musical education, nothing fancy. János: Although we can't make a living out of this band yet I wouldn't put the label 'hobby' on what we do. I think, for us, this is much more like an unpaid work, because we take all this seriously and pour everything we have into it. For us this is not something we decide to do or not to do for today - like you would with a hobby -, but it's almost like a profession with the amount of time / money / energy spent with it coming back to us only in the long run. It's kind of an investment, really. ELOMC: Are you prepared for ‘the fame’? Dömötör: Absolutely. We try to do our business as consciously as possible and we have international plans ahead. For me this is now or never. ELOMC: And the easy question: Is there something else you would like to add? János: We would just like to thank you for the great review, the nomination for the Album of the year award and the opportunity to reach even more people with our music. It's a great feeling that people around the globe are finding our music good or interesting. We hope you will like it and you will give it a few listens - it might surprise you. :] Thank you! ELOMC: ¿Quién es Dreamgrave y cómo es que llegan a conformarse como banda? Dömötör: Bueno, es una historia demasiado larga historia, pero voy a tratar de resumirla. Dreamgrave era en sus inicios una banda de gothic / doom metal con algunos momentos de éxito en Hungría, pero sin una conformación estable y fiable. Como el miembro fundador he luchado en la búsqueda de miembros musicalmente competentes y creativos durante casi cuatro años. Aunque no soy un músico de dormitorio, empecé a trabajar en los fundamentos de un concepto llamado "Presentimient", hice algunos poemas húngaros y toneladas de composiciones más cortas o más largas desde Death metal hasta Post. Sin tener una banda. esas canciones quedaron sólo como archivos de proyecto de Cubase. Luego, en septiembre 2012 conocí János Mayer quien no sólo le ha dado a las canciones un enfoque más Progresivo, sino que se convirtió en el punto de inflexión en la historia de la banda. Así que, básicamente, la fuerza creativa detrás de la banda se convirtió en todo: mi hardrock y death metal progresivo gótico se reunió con el ProgRock Modern de János. En septiembre de 2013, la banda comenzó a grabar los demos con la hermosa soprano de Mária Molnár. Después de un montón de trabajo duro y con la ayuda de Gergő Drahota (VolumeFeeder) y Jenő Godó la banda finalmente entró en el estudio para grabar "Presentimient", un álbum conceptual que consiste en ocho movimientos progresivos de Dark metal. ELOMC: Dreamgrave parece mostrar influencias de muchos sonidos y bandas, pero el hecho es que ninguno es abiertamente reconocible, ¿cómo se definen a sí mismos? Dömötör: ¡Es muy bueno escuchar eso! Una de nuestras metas más claras fue mostrar la suma de nuestras ideas, utilizando tantas diferentes influencias y habilidades de nosotros como podamos, sin empujar las canciones hacia una dirección musical exacta, pero respetando lo que la carga conceptual de las canciones y el álbum en su conjunto merece. Este fue, con mucho, la parte más difícil. Si insistes en una definición estricta: en "Presentimient", Dreamgrave toca metal Dark Post-Gótico Progresivo. ELOMC: Una de las cosas que me sorprenden más con "Presentimient" -aparte de que es un gran trabajo creativo- es que es, de hecho, su primer disco de larga duración y un disco conceptual. Por lo general, las bandas no se inician con una exposición completa de sus habilidades, en vez de eso muestran su crecimiento con el tiempo. ¿Están conscientes de que el público esperará al menos algo tan poderoso como este trabajo en el futuro? ¿Cómo van a hacer eso? Dömötör: Estamos muy seguros de que "Presentimient" es sólo la punta del iceberg, ya que tenemos un montón de ideas diferentes burbujeantes todos los días. "Presentimient" no es el espectro completo de lo que tenemos, o hemos tratado de ser artísticamente. La exploración constante es imprescindible para nosotros. Ahora, habiendo cumplido con el lanzamiento digital, prácticamente tenemos que empezar de nuevo y procrear una nueva instancia de un reino musical ya que no nos queremos repetir a nosotros mismos, en realidad este es nuestro segundo objetivo más importante, junto con János. János: Sí y no sabemos lo que el público va a esperar ya que estamos en una zona desconocida para los seguidores del metal progresivo ¡todavía! Pero lo que sabemos es, que no toleramos las ideas mediocres, ni melodías instrumentales o vocales no comprometidas. Creemos que la diversidad musical es el ingrediente principal para la auto-expresión completa y honesta y este es el rasgo más importante que brilla en "Presentimient". Los comentarios de la audiencia y las críticas confirman esto hasta ahora. ELOMC: ¿Tiene planes de firmar con una discográfica? ¿Han sido contactados por alguna? Dömötör: Ninguna nos ha contactado hasta ahora. Y también somos bastante escépticos. Digamos que depende de la operación. :] El objetivo más candente para nosotros ahora es llegar a ser conocido sen la escena del metal Progresivo y tocar en vivo en todos los países que puedan tomarnos en consideración. ELOMC: ¿Tiene Dreamgrave planes para tocar en vivo? ¿Están tocando actualmente? ¿Los veremos en América Latina? ELOMC: ¿Qué tan bien ha sido recibido "Presentimient" por el público y la prensa? ¿Era lo que esperaban? Dömötör: Claramente positivo. Ni una sola mala palabra hemos recibido de un número limitado de opiniones que hemos recibido en las últimas semanas! Esa es la parte más difícil: Obtener lugar en revistas cuando se es totalmente anónimo para la industria. Afortunadamente Angry Metal Guy (y ustedes;!]) Nos dieron espacio lo que causó un incremento en las ventas al instante, de hecho casi el 20% de los gastos de la grabación y masterización ya han sido cubiertos. La prensa húngara no pregunta por nosotros, ellos simplemente ignoran la banda, pero eso es lo que pasa en Hungría: si no eres una especie de Stoner o banda Indie, no haces un concierto cada fin de semana en la capital con bandas célebres o que simplemente no eres amigo de la persona adecuada, estás fuera de contexto. ELOMC: Sólo por el gusto de una "pregunta difícil" Voy a hacer una aseveración y me gustaría escuchar su reacción: A mí me parece Dreamgrave tiene un gran potencial, suena como que tienen formación musical académica real, y ya que autofinanciaron "Presentimient", yo diría que no son los típicos músicos estereotipados, ni con hambre de éxito, más jóvenes educados, probablemente de clase media, para quienes esto es sólo un hobby. ¿Estoy en lo cierto? Dömötör: Parcialmente. De hecho este álbum significa todo para nosotros. Pero está lejos de ser sólo un hobby: sí, esto lo hacemos en nuestro tiempo libre, pero estrictamente por razones financieras. En la etapa actual sólo traga dinero. Pero no vamos a parar aquí. Sólo Mária tiene conocimientos académico acerca de la música. János estudió diez años el piano, pero sólo en una forma elemental. Por supuesto, cada uno de nosotros toca música desde hace casi una década y tiene una formación musical, pero educación musical básica, nada de lujos. János: Aunque no podemos ganarnos la vida con esta banda yo no pondría la etiqueta 'hobby' a lo que hacemos. Creo que, para nosotros, esto es mucho más como un trabajo no remunerado, porque nos tomamos todo esto en serio y vertemos todo lo que tenemos en él. Para nosotros esto no es algo que decidamos hacer o no hacer hoy -como se haría con una afición-, es casi como una profesión por la cantidad de tiempo / dinero / energía gastada que sólo se devolverá en el largo plazo. Es una especie de una inversión, de verdad. ELOMC: ¿Están preparados para 'la fama'? Dömötör: Por supuesto. Tratamos de hacer nuestro trabajo tan conscientemente como sea posible y tenemos planes internacionales por delante. Para mí esto es ahora o nunca. ELOMC: Y la pregunta fácil: ¿Hay algo más que quieran agregar? János: Nos gustaría darle las gracias por la crítica, la nominación para el Álbum del Año y la oportunidad de llegar a más gente con nuestra música. Es una gran sensación que la gente de todo el mundo está descubriendo que nuestra música es buena o interesante. Esperamos que les guste y le den un par de escuchas - tal vez se sorprendan. :] Gracias! cierto, son excelentes músicos, me pareciese o tengo el presentimiento que nuclearblast, o metal blade o napalm records los pordría contactar, son una gran banda, no soy tan del prog, pero los matices o contrastes que logran son extremadamente buenos.